WASHINGTON — With big deals for fighter jets going to Kuwait, Qatar and Bahrain recently either settled or approved, the Middle Eastern fighter market will be slightly quieter over the next five years. But that doesn’t mean there aren’t a few opportunities still up for grabs, analysts told Defense News ahead of the Dubai Airshow, which runs from Nov. 12-16. “In the last few years, a lot of these contracts have come to completion. They’ve started signing orders. They’ve been approved. So that does limit what they need to be purchasing for the time being,” said Derek Bisaccio, an aerospace expert with Forecast International. Bisaccio estimates the value of the Middle East fighter jet market to be about $22 billion over the next decade, based on projected unit costs per aircraft. That figure could double if including additional services such as spare parts, training and maintenance. In the next five years, Middle Eastern and North African countries are expected to buy about 245 new-build fighter aircraft, said Richard Aboulafia, an analyst with the Teal Group. That figure does not include current orders — like Bahrain’s expected purchase of F-16s from Lockheed Martin, for instance — or purchases from F-35 customers Turkey and Israel. 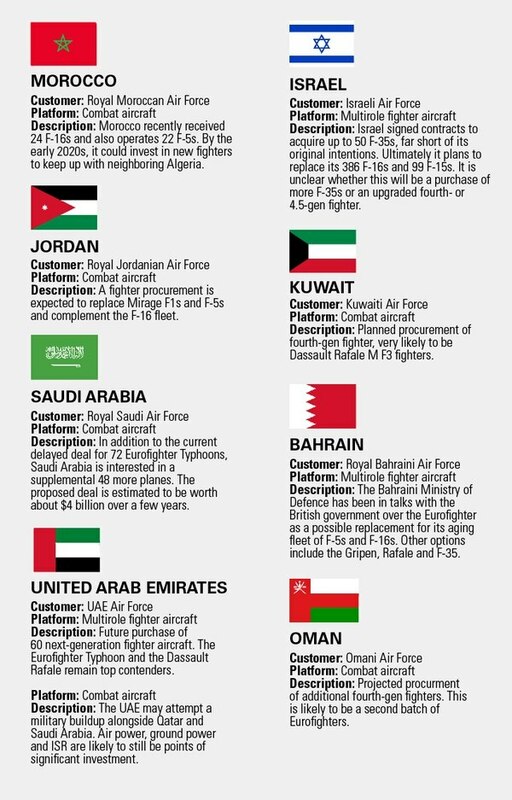 Of the countries still looking for new fighter jets, the United Arab Emirates may be the biggest wild card. The UAE needs to replace its fleet of Mirage 2000s with about 60 new aircraft, but it has lots of options on the table. The country has been considering a purchase of the Dassault Rafale in the past few years, but no deal has solidified yet. The UAE has also expressed interest in the Su-35 made by Sukhoi in Russia, and is collaborating with Russia on a fifth-generation fighter jet, Bisaccio said. In February, the head of Russian defense company Rostec told Defense News that development of the aircraft, based on the MiG-29, would start in 2018. Sergey Chemezov, CEO of Russia defense heavyweight Rostec, spoke to Defense News about the deal, as well as hopes to expand cooperation with the United States under the Trump administration. Further complicating the matter is the UAE’s desire to purchase the F-35 Joint Strike Fighter. The country will “almost certainly” be the first Gulf nation permitted to buy the F-35, said Aboulafia. “The UAE has been the most aggressive about expecting F-35 approval sometime in the next few years,” he said. That approval might come sooner rather than later. 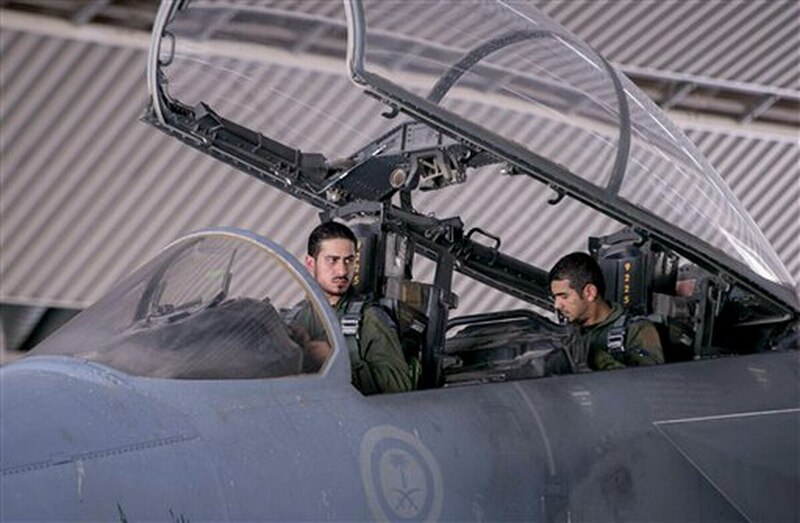 Israel usually is permitted to procure new U.S. fighters five years before other countries in the Middle East, meaning a deal with the UAE or possibly Saudi Arabia could come in the early 2020s, Aboulafia noted. “The Israelis are very good at using this decision for leverage. In other words: If it’s a choice between Arab countries not getting F-35s, or Arab countries getting F-35s and Israel getting another couple squadrons of free F-35s, they’re going to go for that second option,” he said. Another potential big spender is Saudi Arabia. The country cemented a huge deal in 2011 with Boeing for 84 new F-15SA jets and with Eurofighter in 2007 for 72 Typhoons. However, it still needs more fighter jets, and a follow-on order for an additional 48 Typhoons has not materialized yet, noted Bisaccio. A future order “might have to wait a couple of years because of oil prices,” Aboulafia said, but wait too long and it’s possible the F-15 and Typhoon lines could be dead. However, Sebastian Sobolev, a defense analyst with Avascent Analytics, noted that Saudi Arabia has recently purchased new fighter fleets, which could enable it to push projected orders further into the future. It has also begun shifting its focus from air to naval procurement. The U.S. State Department has cleared the sale of almost $4 billion in weapons to Bahrain, including a sale of F-16 fighters that was halted under the Obama administration. That could leave potential fighter buys in Algeria, Egypt and Morocco as well as a light attack aircraft buy from the UAE as the major near-term opportunities, Sobolev said. Egypt has been diversifying its fighter inventory over the past several years, and it’s currently taking delivery of the Dassault Rafale from France and the MiG-29 from Russia, said Bisaccio, who noted that a buy of 12 to 24 more Rafales was likely. In late October, Egyptian President Abdel-Fattah el-Sissi met with French leaders in an effort to push the deal forward. Qatar has also greatly expanded its fighter force, buying 24 Rafales in 2015 and signing a deal for 36 F-15s earlier this year. Most recently, the country signed a letter of agreement in September for 24 Eurofighter Typhoons, but that order now appears to be shaky, Bisaccio said. Algeria typically buys Russian-made aircraft and is likely to continue that trend, said Sobolev. Russian media outlets have claimed that Algeria plans to buy 12 Sukhoi Su-34s — an order that could expand to 40 aircraft — but War Is Boring reported late last year that Russia has no plans to export the Su-34 to Algeria. Avascent also predicts Morocco could invest in four or more fighter jets to keep up with its neighbor Algeria. It currently flies the F-5 and the F-16, which could point to an order for more F-16s. Although not likely to result in a fighter jet order, the UAE’s light attack aircraft requirement could open up the door for the country to buy lower-end combat planes like the A-29 Super Tucano or an armed version of the Air Tractor AT-802 crop duster.